My career started in 1990. On Pancake Day that year,my Dad bought me an old Puch Magnum`X`50cc Automatic Dirtbike from a guy named Roy Pugh,the owner of a shop called `Road And Dirt`,in Newport,Shropshire. My first race was in April 1990,at Buildwas,which is also in Shropshire,with a club called Warley Wasps. We raced with Warley Wasps 3 times a year in a Championship called the Ironbridge Gorge Championship.Things were hard back then and the cost of racing became too much. For the next few years I had bikes but never raced,we moved to Mid-Wales,and my Dad and I used to go riding in the forest by my house (the Dyfi forest). I wanted to ride all the time and any chance I got, I did.Because we weren`t able to afford to go racing and my Dad was busy building a furniture manufacturing business up,I started playing Football, Rugby and also did a bit of Cross-Country running. I was good at all of these sports especially Football. I was picked to play for Wales,under thirteen`s in an International Tournament held in Holland. I also won the County Cross-Country Championships, three years in a row. In 1998,my Dad bought me a Suzuki RM 125,a 1996 model,and we finally had enough money to go racing again. We joined a club called Dredgers, which at the time was one of the biggest Motocross clubs in Wales,and was run by a guy called Sean Smith.By this stage I was riding an RM125 which we had bought from Alan Bates at E.T.James in Rhyader,Powys.Alan was a former British Enduro Champion,and knew everybody in the sport.He organised some support for me through E.T.James,and,after my Dad,they became my 1st proper Sponsor. In 1999,I was selected for the Rider Development Programme by Suzuki Great Britain,where I was trained by former British Motocross Champion,Jeremy Whatley. For several season`s,my Dad,my Sister,& myself travelled throughout the United Kingdom taking part in British Schoolboy Motocross competitions at local and National level,achieving many distinctions including third place in the British Schoolboy Motorcycle Association Championship in 2002,& also third place in the British Schoolboy Motorcycle Association Finals in the same year. During the 2002 season,I joined the Eurolift Suzuki Team,and gained my Auto Cycle Union Expert Licence Status,which enabled me to begin competing in British Championship under Twenty-one Motocross competitions,where i achieved an 8th place overall. In 2003,I moved up to compete in Adult British Championship Motocross,and joined T.M. United Kingdom. On T.M.machines,I Competed in both the MX1 and MX2 British Championship Motocross Classes,and achieved a 12th place overall in 2004. I began competing in British Championship Cross-Country race events on a T.M.in 2005. Following early successes,I was approached by P.A.R. Honda and joined the team in June 2005. With P.A.R.Honda,I achieved many successes,including third place overall in the British Cross-Country Championships,and third place overall in the British Championship Beach Race held at Weston-Super-Mare. I became friends and Trained with former British Enduro Champion Ady Smith through 2005,and later in the year I was selected by P.A.R. Honda to accompany former World Enduro Champion,Paul Edmondson,to The United States to compete in the final round of the G.N.C.C.Cross-Country Championships. I was so impressed with the Cross-Country racing scene in America that i decided to return to The United States with Paul Edmondson in March of 2006,and,once there,i was fortunate enough to be invited by Tim Taber to join the Fun Mart Cycle Racing Team,based in Moline,Illinois.With Team Fun Mart i competed in the O.M.A.Cross-Country race series,achieving 3rd place overall in the 2006 Championship.I also raced at selected Enduro events,finishing as runner-up in the United States I.S.D.E.Team selection event held at Cooperland,Oklahoma. I also continued to compete in as many events as i could in the United Kingdom,achieving first place in the Welsh Enduro Championship,and selection for the United Kingdom Junior Trophy Team for the International Six Days Enduro,which was held that year at Lake Taupo,New Zealand. From 2006 onwards,I have divided my racing career between The United States,Canada,and Great Britain. In 2008,I won the Canadian Cross-Country Championships,Canadian Enduro Championship,Canadian Enduro-Cross Championship,& the XC2 Pro-Lites Class at the Yadkinville GNCC.Following my GNCC victory,i was offered a ride by former GNCC Champion Fred Andrews,on one of his Joey Maurer prepared YZ250F`s.I scored 3 more podiums for Fred that year,& was to remain with him & his team in Salem,Ohio,until April of 2012.In 2008,i also won a Gold Medal,& the Arthur Prince award,for being the highest placed British rider at the ISDE held in Serres,Greece,finishing 11th in E1.At the end of the 2008 season,i also succeeded in earning the A.M.A. National Number 17 GNCC plate. In 2009,I signed to ride a WR250F with Fred`s factory-supported Monster Energy Andrews Yamaha Team,and took part in the full GNCC Series.I ended the 2009 season as 3rd placed XC2 Pro-Lites rider,and I also took 7th place overall in the GNCC Championship. In 2010,I once again competed in the GNCC XC2 Pro-Lites Class in America as a member of the Monster Energy F.A.R.Team,riding a Yamaha YZ250 Two-Stroke machine.I also represented KTM North America,Duroy Racing & LRP Racing Products in the Canadian FMSQ Series,winning their Cross-Country,Enduro,& Enduro-Cross events.During the GNCC Summer Break,i returned to the United Kingdom,&,as a guest rider for the V Customs Team,won both a Fast Eddy Cross-Country race held in Mid-Wales,& the final round of the A.C.U.British Cross-Country Championship,held at Canada Heights in Kent.During the Summer Break,my F.A.R. Team were approached by Husqvarna,& i was offered the opportunity to compete in the final rounds of the GNCC Season on a factory-supported Husqvarna TXC250F.I scored 4 podiums on the machine,which included gaining Husqvarna a 1st place in the XC2 Pro-Lites Class.This was their first major victory in American Cross-Country racing for many years.I ended the 2010 GNCC Season as runner-up in the XC2 Pro-Lites Class,& 8th Overall in the GNCC Championship. In January of 2011,I signed a two-year deal with F.A.R. Husqvarna to compete on the Fuel-Injected TXC250F in the GNCC XC2 Pro-Lites Class,as well as other selected East-Coast Cross-Country & Enduro events.Despite sustaining several injuries through the 2011 Season,I managed to finish 4th overall in the XC2 PRO-LITES Class,& also re-gain my GNCC Number 7 plate.In November 2011,I was honoured to represent GNCC Racing at the final round of the JNCC in Aso,Japan,where I finished in 3rd place. In April of 2012,after four successful year's together,I decided the time had come to part company with F.A.R. Husqvarna.Following this decision,I was approached by long-time GNCC Racer Frank Keegan,& was delighted to become a member of his all-new KR4 Performance Racing Team.With KR4,I changed machinery,& began competing on a KTM 250XC in the GNCC XC2 PRO-LITES Class,& other selected East-Coast Cross-Country events.In addition to furthering my actual racing ambition's,joining the KR4 Performance Team enabled me to expand my overall career within the Sport,as my role there involved Mentoring up-coming new talent,& developing the Team as a whole.Following my Team & Machine changes,my 2012 Season went extremely well. Firstly,I was selected to be a member of the British Trophy Team at the International Six Days Enduro event held in Chemnitz,Germany,where I won my second ISDE Gold Medal.Then,when I returned to the United States,I won my first Overall U.S.Off-Road title at the final round of the American Woods Racing Championship Series,& followed this up less than a week later by winning the Grand National Cross-Country Championship XC2 Pro-Lites title as well,becoming the first Non-American Racer to win this Class. In January of 2013,in preparation for my 2013 G.N.C.C. XC2 Pro-Lites Championship title defence,I joined the DirtWise Schools/KTM-Parts.com/Maxxis Race team,run by former World Enduro Champion,I.S.D.E. Overall Champion,G.N.C.C. Overall Champion & Australian Off-Road Legend,Shane Watts. 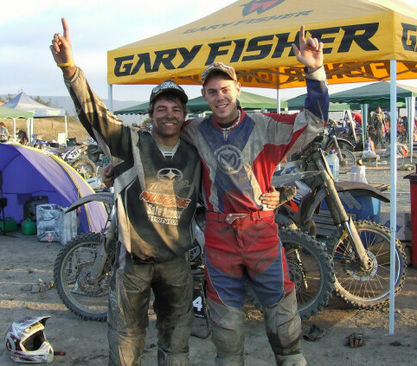 In September/October of 2013, i was again selected to be a member of the British Trophy Team at the International Six Days Enduro event held in Olbia, Sardinia, where i secured my third ISDE Gold Medal. Upon my return to the United States following my International Six Days Enduro appearance, i concluded my Grand National Cross-Country Championship season, finishing as Runner-up in the XC2 Pro-Lites Class, & securing 9th place overall in the Championship, & making this my 5th consecutive season as a top-ten Grand National Cross-Country Championship competitor. In 2014, i continued to race & Coach as a member of the Dirtwise Schools/ KTM-Parts.com/ Maxxis Tires Team, moving up to the GNCC XC1 PRO Class, & also competing in the O.M.A. National Cross-Country Series, where i ended the season as runner-up. For 2015, Shane Watts & i decided to put all our efforts into winning another GNCC XC2 PRO LITES Championship Title, & this we were able to do, winning seven rounds of the thirteen round series along the way, & ending the season with an A.M.A. Number 1 plate & the GNCC National Number 8 plate for 2016. 2015 had been a massive year for me. I had been spending a lot of time with Shane & his family in North Carolina, working on our XC2 Championship challenge & also running 'Dirtwise' training schools with him. Those guys really helped me through a very difficult time in my career, & i enjoyed being around them very much. I also liked the North Carolina climate, so I decided to re-locate there from Ohio. I had been badly injured in a high speed crash at the O.M.A. National round at Sturgis in 2014, which had impacted on the remainder of that season for me, so really i needed the GNCC XC2 PRO LITES Championship focus to get myself back on track. I was very fortunate to have the support of some great friends in 2015, & it was really down to them that i was able to pull through. Come the end of that year, i felt i had pretty much done most of the things in racing i'd always wanted to do, & i was maybe ready to look for a different & new challenge in my life. Thing is though, racing & dirtbikes just gets into your blood, so when Eddie Lojak offered me the chance to compete in 2016 on one of his Lojak's Cycle Sales Team Yamaha's, & some long-term Sponsors such as Maxxis Tires, Moose Racing, Stillwell Performance, Mikametals, StukMX, Wiseco Pistons, Motoseat, Bell Powersports, Liveitxtreme, Ride100percent, Ogio Powersports, TM Designworks, TCX Boots U.S.A., Spectro Oils, IMS Products, Dubach Racing, & DT1 Filters U.S.A. also came on board, i decided to continue racing professionally for a while longer & give the GNCC XC1 PRO Class another go! 2016 was never going to be an easy year for me. Balancing running my new gardencare business & still competing at a top level really stretched me to the limit, mentally, physically & financially. Despite a run of mechanical issues & further injuries including another broken finger, i was delighted to win the North Carolina Hare Scrambles Association 2016 Pro Championship, & also earn a finishers medal at one of the most famous & gruelllng events in the World, the Baja 1000. Through both my racing career & gardencare business i had become friendly with Todd Palmer, owner of Palmer Motorsports in Denver, North Carolina. For 2017,the GNCC Racing Organization introduced a new 125cc only Pro-Am Class, XC3. Thanks to the support of Todd & Palmer Motorsports, Stillwell Performance, Wiseco Pistons, GNCC Racing, Prox Racing Parts, Carbsport, Mika Metals, Motoseat, Bills Pipes, Maxxis Tires, Moose Racing, TCX Boots, IMS Products, Ride 100 Percent, Thestickmangraphx, DT1 Filters, TM Designworks & G2 Ergonomics, i was able to put together a great challenge for this new Championship aboard a Palmer Motorsports Husqvarna 125. 2017 ended up being one of my most successful Seasons ever. Not only did I win the first-ever GNCC XC3 Title for Palmer Motorsports, but I also became the first competitor to win an OMA race overall on a 125, & I won the OMA Moose Run for my Team that year as well. In 2017 I was also a member of the Hicklin Powersports Team which won the Pro Moto 30 Class at the 49th Score Baja 500 event, & I was one of the three-man MCC Of Wales Team at the 92nd ISDE held in Brive, France. Each member of this Team won an individual Gold Medal, (my fourth), as well as winning the Welsh Motorcycle Federation Award for the best British Team result at the event. We earned this accolade by finishing in second place Overall in the Club Championship, the best performance by a Welsh squad in the history of the ISDE up to that date. With such a successful Season behind me, I decided the time had come to retire from professional Racing at the end of the 2017 Season. Whilst this was not a decision I had come to easily, I felt it was right for me, as I had achieved many of my career ambitions. I still wanted to compete, but I was happy to continue doing that as and when I wanted to, fitting some enjoyable Racing around the other things going on in my life. Two things happened in early 2018 though which caused me to reflect on my decision. Firstly, the GNCC organization changed the XC2 Pro-Lites Class rules, which would allow me to compete once more in a Championship I had already won twice. Secondly, I was approached by the Babbitts Monster Energy Kawasaki Team who, Monster Energy having become the official energy drink of GNCC Racing, offered me a contract to race a KX250F for them in the XC2 Pro-Lites Class. This was a fantastic opportunity for me, & I was delighted to accept. My bikes arrived with two weeks to go before the first round of the GNCC Championship, and having been offered the ride I had managed to pull together a great line-up of product Sponsors, so I was feeling all set to do battle again for my third XC2 Pro-Lites Title! Of course, as I knew very well, nothing in Racing is ever plain sailing, so, having assembled such a great Championship challenge, it didn't really come as too much of a surprise when things unfortunately went wrong. At round one, halfway into the first lap whilst in the lead, I suffered a heavy crash which resulted in a major knee injury, sidelining me for the first part of the Season. If my knee injury had happened earlier in my career, I would probably have considered corrective surgery, but, because I was getting older, & hadn't really planned on racing professionally in 2018, I decided to concentrate on a physio-therapy focused healing approach. This process took much longer than I had expected, I would feel the knee was getting stronger, then try a local race to test it, & it would dislocate again, so I would be back to square one. Really, it was a case of learning to adapt my riding style to get around the problem, & it took me most of the year to actually make progress I felt comfortable with. I did have some successes on the KX250F at Regional Races, but I just wasn't fit enough during 2018 to compete in any National Championships, so my time on that particular machine came to an end with the closing of the GNCC Season. 2018 had been a frustrating year for me to say the least, but I've never been afraid of picking myself up & pushing on, so, after a refreshing Christmas & New Year spent with family & friends in the U.K., I returned home ready to face the challenges of 2019. Initially, I wanted to focus on something I'm very passionate about, Rider Development Schools. Having spent over 25 years Riding & Racing Motorcycles at every level, in every condition, on different Continents & with different industry support, I knew I had a great deal to offer other Riders & Racers in many & various ways as a Teacher & Mentor. Focused on this vision, in January 2019, I launched my new Rider Training Venture, www.offroad-riding.com. Racing-wise, the knee injury I had sustained in 2018 was still a potential problem. I had had no re-constructive surgery carried out on it, & was relying on the improved strength of the muscles surrounding the damaged area. Going racing would be taking a risk. I still wanted to compete though, & I felt it was important to my rider training business to continue demonstrating my abilities on the track at the highest possible level. With this in mind, I held discussions with several potential Sponsors from both inside & outside the motorcycle racing industry, &, with their generous support, I was able to put together a viable package based around a two-stroke 125cc Husqvarna for the season's GNCC XC3 Championship challenge, plus selected regional series races. Putting together a competitve racing presence is not an easy task, & my 2019 campaign would not have been possible without the greatly appreciated assistance of the following individuals & companies: Stillwell Performance, Maxxis Tires USA, Fly Racing, 100% Moto, IMS Products, MotoSeat, Dirt Bike Off-Road Riding School, ProX Racing Parts, P3 Composites LLC, @carbsport, @dpbrakesracing, Rekluse Motor Sports, @stickman_stickers, @anthonybalistreri, The Helmet Hook, DT-1 Filters, Mika Metals, @g2ergonomics & Highland Temporary Works Ltd.
FAVOURITE FOOD Pasta, Mars Bars, Chicken Korma! HOBBIES Mini Bikes, Girls, Ice Skating, Girls, Cycling! MOST VALUED POSSESSIONS My Dad,Jezza,my Mum,Michelle,my Neice,Carley,my Sister,Louise,& my Dog,Kip. Winner of 'America's Toughest Race' - The OMA 'Moose Run' - 5th November 2017, Morrison, Illinois. ISDE MCC Of Wales Club Team Member (2017). This Team won the Welsh Motorcycle Federation Award for the best British ISDE Club Team at the 2017 event. 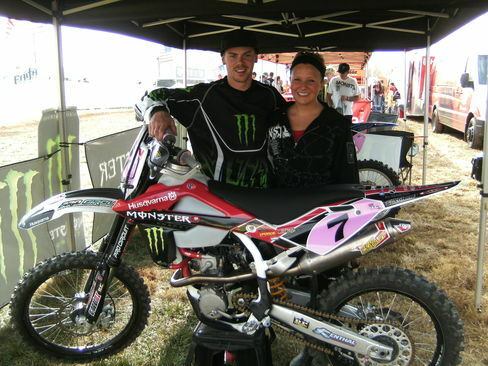 2010 GNCC XC2 PRO-LITES CHAMPIONSHIP RUNNER-UP. 2011 JNCC-AAGP (ASO) 3rd Place Overall. 2012 American Woods Racing Championship Series - (AWRCS) - OVERALL CHAMPION. 2013 GNCC XC2 PRO-LITES CHAMPIONSHIP RUNNER-UP. 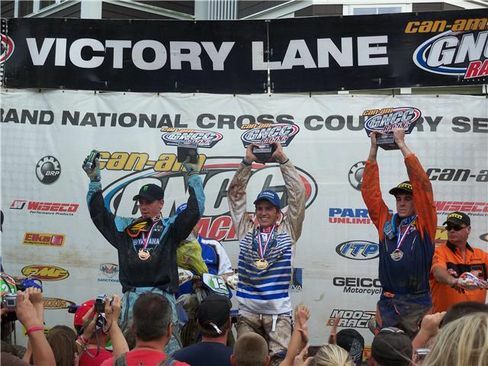 2013 GNCC OVERALL PRO Championship 9th. 2014 OMA NATIONAL CHAMPIONSHIPS PRO 1 CLASS RUNNER-UP. 2015 GNCC XC2 PRO-LITES CHAMPIONSHIP WINNER. 2015 GNCC OVERALL PRO Championship 8th. 2016 NORTH CAROLINA HARE SCRAMBLES ASSOCIATION PRO CHAMPION. 2017 49th Score Baja 500 - Member of Hicklin Powersports Pro Moto 30 Class-winning Team. 2017 92nd ISDE - Brive en Correze, France - Member of the MCC Of Wales Team which finished in 2nd place Overall in the Club Championship Class, the highest scoring Welsh Team finish in the history of this event, & also the highest scoring British Club Team finish at that ISDE, earning the Team the Welsh Motorcycle Federation Award for this achievement in 2017. 2017 FIRST EVER GNCC XC3 CHAMPIONSHIP WINNER. AMBITIONS To be World Champion E1. To win as many British titles as I can. ACHIEVEMENTS British Enduro Champion, Scottish MX Champion, 5th European Enduro Champs, Winner Dawn to Dusk 12hr, British Championship MX points scorer. AMBITIONS to finish in the top 15 overall in the British Motocross Championships. JOB TITLE Director Of Rat Adventures. PRINCIPLE FUNCTION to enhance Ratboy`s phenomenal capabilities. RELATIONSHIP TO RATBOY I`m his old man. LIKES Pike fishing, weekends in Prague, driving accross America, eating curry. DISLIKES work, Ratboy`s socks, changing tyres, women who think racing is a hobby. FAVOURITE COLOUR red, white and blue.also check, like the flag. FAVOURITE PEOPLE Ratboy, his sister Louise and my grandaughter Carley. FAVOURITE RIDERS Barry Sheene, Kenny Roberts, Ron Haslem, Jeremy Whatley, Paul Edmondson, Tim Taber, Ady Smith, Geraint Jones, Alan Bates, Kip Herring, Jimmy Jarrett, Fred Andrews, Shane Watts, Daryl Bolter, Ricky Mair, Rudy Austin. FAVOURITE TRACKS Matchams Park, Blaxhall Pits, Morrison, Illinois, Namur, Crawfordsville, Indiana, Wakes Colne, Gore Basin, Hawkstone Park. BEST EXPERIENCE ON A BIKE passing Ratboy in the Dyfi Forest on an RM125 when he was 15. WORST EXPERIENCE ON A BIKE breaking my leg at Winterbourne Gunner in a Dad`s race at the B.S.M.A. nationals in 2002.